Jade Was Ecstatic, Daddy Just Wanted To Go Home. When I was younger I always knew I wanted to have children. Literally, I wanted to be pregnant and nurture and carry my child for nine months. When I saw “Twins” with Arnold Schwarzenegger and Danny De Vito I was beside myself with excitement as it seemed my dream could one day become a reality. Unfortunately it turned out I was delusional and this was never going to happen. It’s a great shame as I’m sure I would have been glowing and radiant throughout! When I found out I was going to be a daddy for the first time I was just excited and cried a lot. Within a short time though other emotions were added to this, mainly fear. I realised the huge responsibility we’d have as parents in shaping our child’s personality, behaviour, views on the world and their overall life. This was all within the first hour of finding out, it was a little overwhelming to say the least. Now, over 12 years later, not a lot’s changed. I’ll save all the big stuff for another time but for now I’m going to focus on roller coasters. Give me a second, this is a bigger deal than you might think. I’ve always loved roller coasters, the bigger and scarier the better. Ten upside down loops, bring it on. Severe G force effects whilst a tiger nibbles on my ear, love it. Since I was in my twenties I’ve dreamed of the day I could take my child on a roller coaster as a right of passage. None of this playing football in the park or going fishing malarky. For me, it’s always been roller coasters. When Jade was 5, on the day she lost her first tooth, I took her to Lego Land. They had a small child’s roller coaster there and we got as far as the queue but she took one look at it in action and declared, “I don’t like that daddy, can we have an ice cream instead?” I did win her a giant cuddly cow by landing two balls in a bucket so the day was extra memorable for more than one reason. On subsequent family outings to theme parks roller coasters have been avoided like the kisses on the lips your aging Grandma insists on even though she still smokes 40 cigarettes a day. 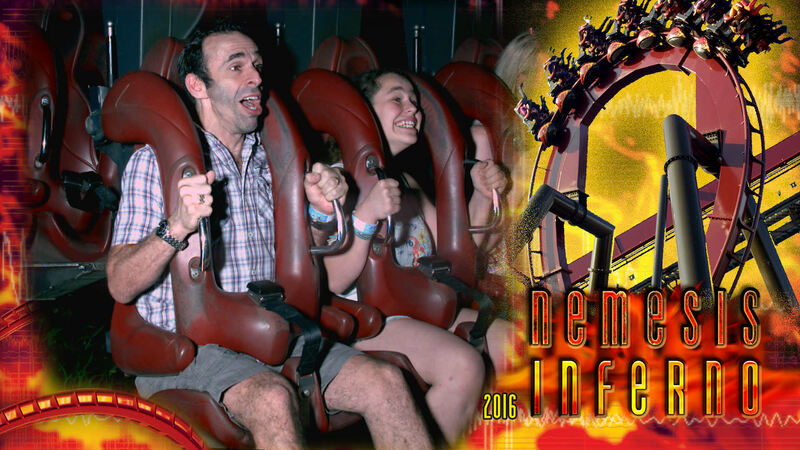 Three years ago when she was 9 we went to Thorpe Park with friends and she was cajoled into queuing for Nemesis Inferno. As we waited in line and she watched everyone hurtling upside down she went very quiet and started to look a bit terrified. I managed to distract her all the way until we were about to get on which was when she started crying saying, “I don’t want to do it daddy, please can we go.” (Please don’t judge me too harshly for what happened next). The obvious thing to do was to get off the ride and let her friend and mum go on without us. Deep down however, I knew that she was going to love it so I did something that will always haunt me and make me feel like the world’s worst dad. I sat down on the ride along with Jade’s friend and mum so she had no choice but to get on. With her buckle locked in and her crying intensifying to near screaming I was desperate. I bribed her with a promise of an ice cream and £2.50 for being so brave. This had the desired effect and the screaming reverted back to crying. She gripped my hand like a vice and we were off. The crying stopped and was soon replaced with screams of delight all the way round. When we finally stopped she turned to me with a huge beaming smile and said, “That’s the best thing I’ve ever done in my life.” I was vindicated and knew I’d done the right thing. I still felt like a bad, bad daddy though! Fast forward three years and last week the two of us went to Thorpe Park together. She hadn’t been on another roller coaster since Inferno Gate above so was quite nervited (our word for being nervous and excited at the same time.) 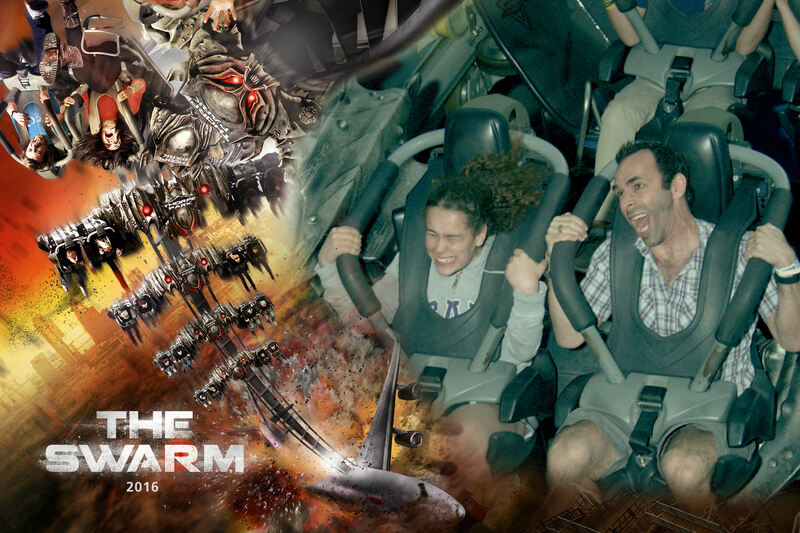 We went on The Swarm, Inferno and Colossus and had the best time. My dream was fulfilled and I was so proud that Jade felt able to push herself enough to conquer her fears and embrace the challenge. I believe life is made up of little moments that can shape your future and Inferno in 2013 was definitely one of them for Jade. It was almost a perfect day as she desperately wanted to win a giant cuddly donut and to do so I had to land two balls in a bucket again. I felt good and confident, what could go wrong? As it turned out, plenty. Basically, you need to spin the ball (baseball sized and very heavy) in the air so it hits the bucket and stays in. If you throw it normally it will simply bounce out, no matter how gently you do it. I carefully aimed, spun the ball and it went through a hole under the bucket and was lost. Cue laughing from the hordes of people watching. Now with added concentration I spun the second ball but as I did so my hand had a momentary spasm and the ball flew out my hand and smacked the attendant square on the head. Cue more raucous laughter and a slow walk of shame from me. It was a very special day. 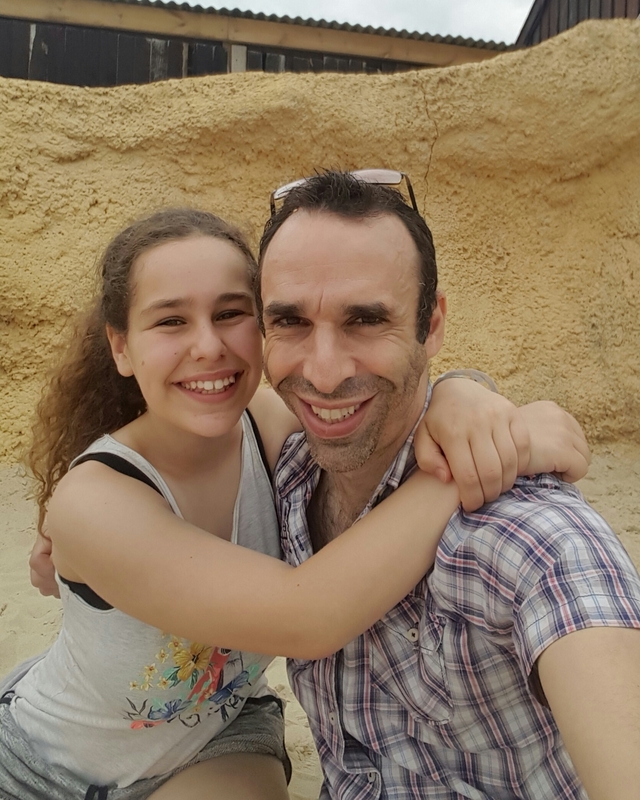 Quality time with my daughter, bonding over roller coasters and pizza and a realisation of how quickly time flies. It seems like yesterday that days out included nappy changing, muslins to clear up sick, bottles of formula milk and three changes of clothing, all encompassed in a carry bag that weighed 50lbs. I’m very proud when I look at my children, growing up quickly with a good sense of self, clearly knowing what’s right and wrong and having a good heart, sense of humour and a love of roller coasters.